In my courses on Web Design, EG-146, EG-153, EG-259 and EG-253 I have long advocated the use of Firebug as must-install developer tool. Over recent years, Google’s Chrome Browser, Apple’s Safari, Opera and even the new Internet Explorer have built developer tools into their standard browser offering. 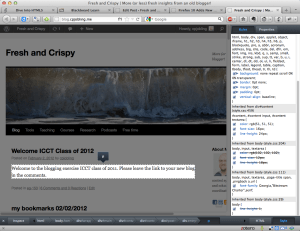 In Firefox 10, released on 31st January 2012, Firefox has finally built-in developer tools too, and they look pretty slick. And more is to come in Firefox 11 to be released in March. Here’s a short video introduction and you can read more in Developer Tools in Firefox Aurora 10 and in An Overview of Firefox Developer Tools and Firefox 10 Arrives with New Dev Tools and Full-Screen API.